HOLLYWOOD -- Legendary pop singer Madonna -- known for such AARP-friendly hits as "Like a Virgin," "Justify My Love," "Express Yourself," "Crazy For You," "Papa Don't Preach," "Dress You Up (In My Love)," "Girl Gone Wild," "Give It 2 Me," and "Erotica" -- turned 60 Thursday. She is celebrating her milestone birthday with a special game of Bingo down at the retirement home, with special guests Mick Jagger and Keith Richards. There will be karaoke of Madonna's biggest hits, cake and ice cream, and Grandma's Cookies... baked by every woman tenant. The party won't be too late. 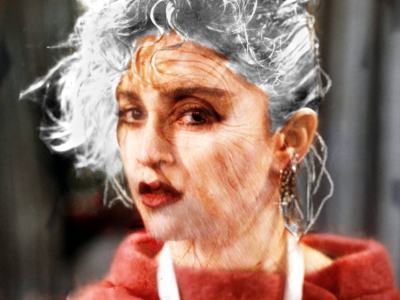 "I'm 60," Madonna said as her dentures fell out, "I'm too old to be staying up that late. Plus, Matlock and Murder, She Wrote are on before bedtime. Who are you again, sonny? Where's my teef?" 35 years ago, Madonna released her self-titled debut album, featuring her first hit, "Holiday," as well as "Borderline" and "Lucky Star." Her most recent album was 2015's Rebel Open Heart Surgery. She is planning a new album to be titled Hip Replacement. "Like a vir… Zzzzzzzzz," Madonna said as she fell asleep in her oatmeal. This page was last edited on 4 September 2018, at 12:44.